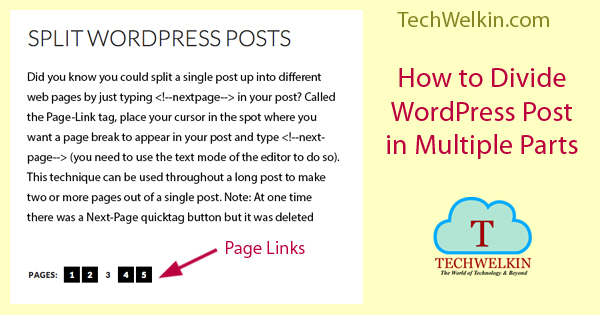 Splitting a WordPress post in multiple parts is easy. Although this approach has its own benefits but it should not be used excessively. Learn how to divide a post into multi-part pages. This morning I wrote about how you can reduce bounce rate of your website. One of the tips I gave in that article involves splitting of one post into many parts. WordPress provides a very easy way to divide your post in as many parts as you want. I also cautioned against excessive use of such division because this will dilute the impact of your post on both search engines as well as humans. But if you really have a very long post and readers have to endlessly keep on scrolling to reach the end of it —then you can opt for splitting and multi-part post. It’s easy but use it sparingly! How to Split a Post into Many Parts? WordPress has an in-built feature to this end. If you enter the following code anywhere in your post, the post will get split from this point onwards. IMPORTANT NOTE: This code must be entered in Text mode when composing your post. If you enter this code in Visual mode —this will not work. You can keep on adding this code in your post content to split it into as many pieces as you want. The following example will create a four-part post. When you publish such a multi-part post; navigational links will automatically appear at the end of each part of your post. You can stylize these pagination links by setting / modifying CSS rules in your stylesheet. What if Navigation Links Do Not Appear? If you’re using a good enough theme, links should automatically appear. But in case pagination links refuse to show their face, you can just go to single.php and add the above line of code into it at a place where you want links to appear. or anything else of your choice. For these options, the entire tutorial is available in WordPress Codex for Stylizing Page Links. Have a look at it to learn more. Can you create multi-part pages in WordPress? Yes! the same code works on posts as well as pages. It looks nicer than having a very long post that would otherwise span over ten A4 size pages! Well, this is it for today. If you have any questions, comments or suggestions —feel free to say it in the comment box. Thank you for using TechWelkin.